This text by W. MARK SUTHERLAND was published alongside NOBUO KUBOTA‘S Sonic Scores exhibition. I don’t know that I think in terms of language. WMS: Your vocal work and sound poetry is a hybrid of free improvisation, jazz scatting, body noises, and a glossolalic mix of the Japanese and English languages. Are you fluently bilingual? NK: No, I don’t speak Japanese, but my ear is tuned to the Japanese sound. I’m very familiar with Japanese sounds, not only in language, but also in songs, Kabuki, films, etc. Even though my exposure to it is limited, I can hear all the nuances in the language. My parents spoke Japanese, and I learned just enough Japanese to communicate with them. They spoke in broken English. My mother never learned to speak English; my father did. From grade six on, I went to a Japanese school after regular school. When the other students went home, the Japanese kids would trudge down to the Japanese school for an hour and a half of Japanese lessons. So my ears are attuned to the sound of the language, which is quite different from understanding the meaning of the language. For instance, when I perform my sound poetry or sound-singing, I use these Japanese sounds, but I’m not saying anything specific with them. WMS: Tell me a bit about your cultural background as a Japanese-Canadian. What genres of music were you exposed to in your family home, and when did you develop an interest in jazz? NK: The only Japanese music that we had in the house was these 78s that my father would play over and over again. They were Japanese soap operas, stories put to song. I never knew what was being said, but I became very familiar with the tonal qualities of the language, the songs, and the music. So that remains a part of me. My sisters, who were older than me, would listen to popular music, and I’m familiar with all the music that was popular during the late 1930s and early 40s. Then the war started. We moved to the internment camp, and that changed my entire exposure to the Japanese community. I had only Japanese friends, and I went to the Buddhist church every Sunday until the end of the war. The Buddhist church is very important to me in terms of sound, because we sang sutras, prayers; and they were all in Japanese or Chinesevery difficult for a kid to understand. Again, my exposure was to the sound qualities, and not the meaning of these prayers and sutras. I had no idea what it meant! By then, my sisters had records of the latest hit parade songs, and they played a lot of records of the big bands of that eraGlenn Miller, Tommy Dorsey, Benny Goodman, Duke Ellington. After the war, the bands of significance were Count Basie and Dizzy Gillespie. The big bands marked an important transition in jazz at that time. Then came bebop and the cool. One of my first musical experiences in Vancouver was going to the Beacon Theatre on Hastings Street, a movie theatre that used to have bands playing in between the films. They would show the movies, then the curtain would go up, and there would be these bands that played. We’d always sit in the front row, and one time, when I was about seven years old, the curtain went up, and there was Duke Ellington and his orchestra! I couldn’t believe it, the shiny brass instruments, and the incredible sounds, especially from brass instruments. That was a very significant experience in my childhood. Naturally, I began to equate a lot of musical experiences to jazz from then on, and by the time I was in high school in Toronto, I was a jazz buff. I had many of the great jazz records. By sixteen years old, my friends and I were going to the Towne Tavern and the Colonial Tavern, listening to all the jazz greats, even though the drinking age was twenty-one. When I think back on those days, we were a bunch of teenagers that loved jazz. We would go in and sit right in front of the band, order a beer, sit there nursing the beer, and listen all afternoon or all evening to jazz. You name themthey all came through TorontoJohn Coltrane, Miles Davis, Art Blakey, Dizzy. And I even saw Billie Holiday. Those experiences really established my involvement and interest in jazz from then to this day. WMS: Tell me about your very unusual visit to New York as a teenage jazz fan in early 1950s. NK: I was seventeen, I guess, in high school at Central Tech. in Toronto. My closest buddy was a guy by the name of Vlaj Handera. Vlaj and I were inseparable when it came to going to listen to jazz. We would go to Buffalo and New York City to listen to jazz. We would go to all the great jazz spots in New York: the Apollo, the Savoy, The Five Spot. When we were visiting New York, we’d stay in this funky little hotel in the Village, where Dylan Thomas used to stay. We used to scribble on little pieces of paper, Under Milk Woodpossible title, and stick it at the back of the drawer in our hotel room when we were there. One day, when we were in New York, Vlaj says, Let’s call up Thelonious Monk. So we get the phone book, and discover Monk is in there under Thelonious Monk! We call him up at around eleven o’clock in the morning, and he comes on the phone, and we say we are from Toronto, Canada, We are great fans of your music, and we’d like to come and see you. He said, Sure, and bring a bottle of gin. So we go out and buy the bottle of gin, and we take a cab to his place. He had just gotten up, and he was still in his bathrobe, and there were two or three kids around him. He immediately starts into the gin, and we’re sitting there talking about jazz, and about when he had came to Toronto. Then another guy comes along, and it’s his drummer. Monk introduces us to him. Monk was in his forties, here with these teenagers from Toronto, Canada, but he treated us in a very friendly fashion. The drummer says, Let’s go and see Art Blakey. You guys want to come? I said Sure! Then he says, We’ll get a cab and go first. Here is the address, and you follow us in another cab. By the time we got to Art Blakey’s place in Harlem, they were nowhere in sight, they’d already gone inside. So we went into the house, and Art Blakey’s door was at the end of the hallway. He had this big metal-clad door. We knocked on the door, and as we waited for someone to open the door, these two other black guys came in the front door. They came up to us and said, Are you going to see Art Blakey? We said, Yeah. They said, We are, too. The door opens a crack, and these two guys come crashing up against the door trying to break it down. They were cops! Narcs! But, there were enough people inside Art Blakey’s place that they all ganged up on the door, and managed to close it. There was no way that the narcs could break down the door, because it was like a metal fire door. So now we’re standing in the hallway outside the apartment with these two narcs. I nearly pissed my pants! I couldn’t believe it! Anyway, the narcs questioned us and searched us, but they had to let us go. They knew we were just innocent teenagers from Toronto. But I’ll never forget that day! Damn! I could have met Art Blakey! WMS: As an improvising musician, you honed your chops as a founding member of two of Canada’s seminal free-jazz bands; first with The Artists’ Jazz Band (19621974), and then with CCMC (19741992). When you left CCMC in 1992, you gave up playing the saxophone and percussion instruments for solo voice-work. What was the reason for your departure from CCMC after so many years? What inspired and influenced you to begin exploring the potentialities of human utterance? NK: First, let me say that The Artists’ Jazz Band was a totally different experience than the CCMC. The Artists’ Jazz Band in the beginning was all visual artists: Gord Rayner, Rob Markel, Graham Coughtry, and myself. Mike Snow would come and play when he was in town. We were all self-taught musicians, no formal training, but the music that we played was very exciting, extremely emotional. We imitated music from our favourite records and musiciansespecially Charlie MingusLord, don’t drop that atomic bomb on me! There was nothing like it. A lot of it featured our own compositions. We brought to the AJB an attitude of how we felt emotionally about the jazz bands, and reconstructed the music to suit our style. Wein a minor wayimitated what they were doing, but the music was focused on our emotional connection to jazz. We had a great time doing this. It was all very exciting. We were very enthusiastic about the music and improvisation. It was the abstract expressionism of sound! Throughout all this, we had formally trained jazz musicians like the Henstridge brothers and Terry Forster sitting in with us. Ian Henstridge was a bass player who played with the legendary Lenny Breau, Terry Forster was another respected bass player, and Wimp Henstridge was a wonderful tenor saxophone player. For some reason they liked to play with The Artists’ Jazz Band. The CCMC, on the other hand, was very different. It was all about improvisation. You had people like me, who had no formal training, and other musicians who had varying degrees of formal training. The music, therefore, appeared to be structured at times, and also very free. But, the band was truly spontaneous. We would turn corners on a dime, and slide into something that was totally different. The CCMC often created an extremely textural form of music, and it was very loud. The textural part of the music almost approached noise in its intensity, and it’s probably one of the reasons why my hearing is really fucked up. It seemed to me that once we got into the textural elements of the music we would crank up our instruments, and play louder because it would seem to enhance not only the textural qualities but the production of new tonal qualities that would rise, fall, and weave throughout the noise. The CCMC was an exciting band. I learned how to improvise with the band, and to take a lot of chances, and explore freely and fearlessly all possibilities. The sounds, and the form of the music were exhilarating! Unfortunately, at some point in the late 1980s, my ears started to go, and I thought it would be wise to quit the band to try to save my hearing. In the early 1980s, the CCMC had invited the Four Horsemen to come and perform with us, and that was my first exposure to sound poetry. Up to that point in time, my art was connected to the AJB and the CCMC. There was no connection to whatever was happening in the literary community. Suddenly, here were these four guys, The Four Horsementhey were nuts. I thought, What’s going on here? I listened to what they were doing, and I was totally fascinated by them. So I started to use my voice more and more with CCMC, until I finally decided to quit the band in 1990. Then, once I decided to quit the band, I started to explore all the possibilities of the voice, and I read about and listened to sound poetrythe Futurists, the Dada movement. In the early 1990s, I did a number of duets with Paul Dutton, and we would perform [a mouth-percussion piece of his] together, and that took me in another direction again. Of course, I met you in 1991, and we worked for quite a number of years together, exploring what the human voice could do. So there it is: the reasons why I left the CCMC, and how I started performing sound poetry. WMS: I consider Mouth Mechanics (YYZ Gallery, Toronto, 1999) one of your finest solo public performances. Please explain the concept of Mouth Mechanics to me, and the subsequent development of that performance. NK: I can’t really remember how Mouth Mechanics started, but one of the things I remember is that I had just bought my first video camera, and I was thinking about things I could do with it. One of the things that occurred to me, as a result of my introduction and investigation into sound poetry, was to explore the mechanics of the mouth, and the varieties of sounds that could be produced through different parts of the mouth. Then, I began to think about the source of the sound, the source of the air from the lungs. I followed it up in a simplified manner to the larynx. Then, I considered the different cavities of the mouth and the nose, and the sounds that could be produced up to that point. For the Mouth Mechanics performance, I created sounds moving slowly from the lungs to the larynx to the nose, and then the mouth. First, I focused on different degrees of air pressure in the lungs to make sound, then on the muscles of the larynx, the nasal cavity and finally, the mouth cavities, with different ways of shaping the mouth, and using the tongue on the roof of the mouth, the back of the teeth, etc. I concluded the performance by chanting Japanese phonetics. Japanese vowels ah, ie, uh, eh, oh, sound very similar to English language vowels, but the Japanese affix consonants to the beginning of all the vowel sounds. So if the letter is k, it would be ka, ki, ku, ke, ko; or m: ma, me, mi, mu, mo; or z: za, ze, zu, ze, zo. When I went to Japanese school in Vancouver, that’s one of the things we used to practise. I thought I could use those sounds, which are very familiar to me, by exploring vocal sound or phonics. As I said, I had just bought my first video camera, and I was thinking about things I could do with it. So I decided to make a video of mouth mechanics. I set the camera up, and pointed it into my mouth, and it became apparent that I had to light the inside of my mouth to get an image back to the pharynx. I got this lamp and pointed it at my mouth, and then, I turned on the video camera by remote control, and made one of the early videos of my Mouth Mechanics. I decided to do a performance of Mouth Mechanics at YYZ gallery in Toronto. YYZ had a video projector, so I connected the camera to the projector, and I sat next to the screen in front of a wall, and the whole inside of my mouth was projected on the wall while I performed Mouth Mechanics. Mouth Mechanics was an important part of my investigation into sound poetry, because it forced me to make these sounds in public. It led me to experiment, and to explore the possibilities and mechanics of the voice. WMS: Intermedial hybrids are the keystone of your creative practice. Nobuo Kubota at the Western Front, Part 2 (Western Front, Vancouver, 1989), and Video Lab: Loop Holes (Justina M. Barnicke Gallery, Toronto, 2004) are excellent examples of integrating vocal performances with video to create aesthetic hybrids. Briefly explain the structures used to create Western Front Part 2 and Loop Holes. NK: Western Front, Part 2 (198889): In 1988, Kate Craig called me from the Western Front in Vancouver. I had met Kate during one of the CCMC trips to Vancouver. She knew that I was doing some voice things, and she thought that I might be interested in working with video. She called up and said, How would you like to come and do a residency here at the Western Front, and we will make a video? We’ll put you up, show you how to use the equipment, and give you a technician. I said, Sure. It was a terrific experience. I had never made a video before, but I was going to stay in Vancouver for three or four weeks, so I had time to think about what I wanted to do, though I was initially at a loss about what to do with the video. What subject matter should I use, or how would I approach making a video from my position as an artist who did installations and sculptures? So the first thing we decided to do was to make a video of me singing, and making vocal sounds. Kate was the camera operator, and we spent a couple of days shooting a number of takes. I looked through them all, and picked one take that I thought was appropriate. It was about fifteen minutes long. I decided I would take the video apart, and put it back together again. The continuity in the vocal singing was interesting, but I thought it would be more interesting visually and sonically to move it around, cut it back and forth. So I started to do that, but the problem I encountered was that putting the tape pieces back together required making an aesthetic judgment. I would look at the edited piece, and I would think, That sounds good, looks good. But the next day, I would come back to reconsider what I had done, but it wouldn’t do a thing for me. At that point I thought, Wrong approach; certainly not a conceptual one. So I decided to do a conceptual piece. In those days, the video editing systems were analog, and when I think back on it, I really liked the analog system, and the particular way it functions, although a digital format is certainly easier to do things on. Still, I like the hands-on, material aspect of editing in analog. Anyway, I decided to take two waveforms, one waveform that went from 1 to 7 to 1 (cresting at 7), and another waveform that went 1 to 15 to 1 (cresting at 15). The first waveform was used to extract the sound and image from the tape, creating an open slot. The second waveform was used to select a sound/image from the tape, and fill the open slot with it. The result of the interaction of the two waveforms is an oscillation of the selected sound and image. Due to the different lengths of the two waveforms, if they started at the same point, one would move ahead of the other, and vice versa. When you watched the video, you would say, I’ve seen that clip before. The inserted clips are from the past, present, or future, in the form of oscillations created by the two waveforms. It’s a very basic representation of how oscillation occurs. So I decided that’s a good conceptual idea, I can use it, and whatever comes out of the process is the finished work. That’s how Nobuo Kubota at the Western Front, Part 2 was made. So much for aesthetic judgment! Now Loop Holes is about repetition. It is composed of nine separate monitors, in a grid, playing the same tape. I had decided, because it was about repetition, I would move the running time of the tape forward by half a second on the second monitor, and between each of the monitors. So, between monitors one and nine, the accumulated time would be four seconds. I was trying to show what happens to a video/audio sequence when it’s repeated and extended for a period of time. People who look at it obviously recognize what I have done. It’s not a complex piece. But you begin to notice that half a secondwhich doesn’t sound like a lotcan dramatically change the image and the sound in a piece, and the relationship of one to the other. I used nine monitors and nine separate DVD players for the Loop Holes installation. The presentation of the nine tapes on the nine monitors was random. I made sure that there was, at least one monitor separation both horizontally and vertically between each consecutive tape, since the purpose of the installation was to show variety and differences created with a half-second time-lag separation of image and sound repetition. WMS: Phonic Slices and Deep Text are very handsome bookworks published by Coach House Books (2001) that certainly complement your exhibition Phonetic Slices (Lonsdale Gallery, Toronto, 2001). However, I think that your Sonographs visual poems are exquisite. Tell me about the process and technique used to create the Sonographs. NK: I’d like to begin by talking about Deep Text, Phonic Slices, and Phonic Traces, as they are all loops. Deep Text is composed of thirteen plastic sheets, because the longest word of Deep Text contains thirteen letters. I started out with a simple description of the process of looking at text in depth. But the essence of the work is about looking at the individual letters on the transparent plastic sheets. Once the work is installed, and you look through the text and the individual letters, the relationship between the letters of the alphabet to the meaning of the text is no longer apparent. Each letter of the alphabet stands on its own, creating new relationships to other letters of the alphabet surrounding it, and the deep structure of the text itself becomes meaningless. If you move your head up, down, back, or sideways, the relationships of the letters to one another change. You can even use the separate sheets as a score to voice the alphabet. I guess it also turns into another language, a phonic language or a sonic language. So, the whole piece starts with a semantic description of what’s going on, and then it breaks down, separating into hearing and seeing, and coming full circle. With Phonic Slices, I cut about one thousand two-and-half inch letters from a three-quarter inch-thick piece of pine. Then, I glued and compressed the letters together to form a phonic loaf (18 in. x 14 in. x 24 in.). The loaf was sliced into eighteen pieces, one-inch-thick flat planes or tablets. Rubbings were made from the tablets, and Phonic Rubbings, therefore, became the third part of the process. Phonic Slices is about changing the relationships of letters in a random manner. Finally, the slices and rubbings can also be used as phonic/sonic scores in a performance. The piece that is clearly a loop system is Phonic Traces, where I isolated the letters from words by strategically cutting the letters into two pieces, creating two new forms that are independent from the original form. By taking each letter and splitting it into two parts, I destroyed the source of the alphabetits sound and history. Having destroyed the original form, I gave the two pieces a new sound that contained remnants of the original. Visually, the shapes of the half pieces of letters become sculptural. When I constructed the new form with a sculptural attitude, the traces became a phonic/sonic sound language. 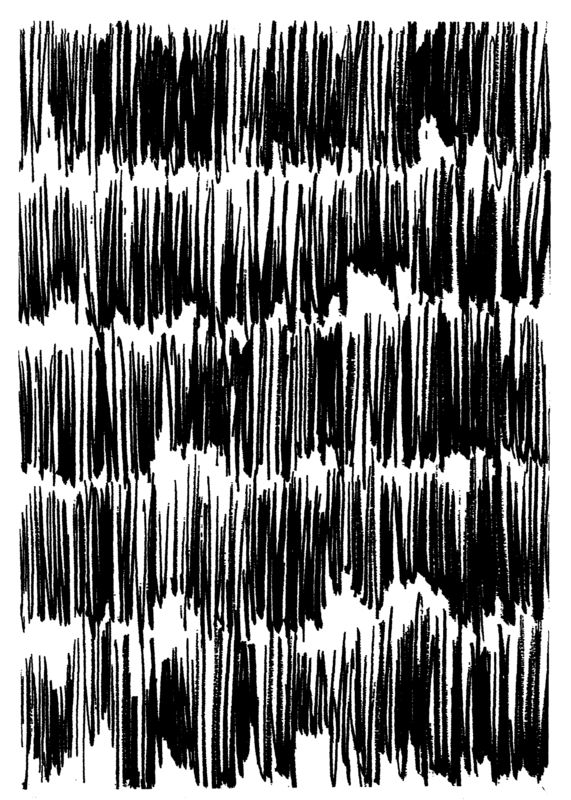 I’ve always been interested in calligraphy, and I began the Sonographs around 2000. I started to practise with a brush and ink, forming different shapes on paper, using a kind of calligraphic style without any historical relationship or connection to language. As I was practising doing these shapes, I would start to sing. The singing and the writing of these forms became a new experience for me. After a year or so, I became quite adept at doing these works. They went in different directions. Some Sonographs were more spatial than others. Also, once I started to do the Sonographs, I departed from the traditional Japanese calligraphy. I didn’t work from the top of the page to the bottom, and move right to left. I was thinking about this the other day, that it’s a natural way that the Japanese calligraphy developed. You start at the top and work your way down the page. But I abandoned that, so that I could start anywhere I wanted to on the page. I could start in the middle of the page, and work around the page, or I could move to different areas of the page, and concentrate on them. The traditional page became an empty field to be filled with different shapes and sound. WMS: What fascinates me most about the Sonographs is their direct connection to a form of gestural poetics. While they have sonic potential, the actual production of the Sonographs is closely tied to the physical body, brush to hand, hand to arm, etc. NK: Yes, the brush is a fascinating instrument, because you can go from a really thin delicate line to a bold stroke. Interestingly, I started to write left to right, that’s the way the English language works. I suddenly realized that the influence moved from Japanese calligraphy to Islamic script, at which point I was very aware that the shapes I was making seemed to come from the Islamic tradition. When you examine the Islamic script, there are all kinds of little tiny squiggles around it, so once I had finished working left-to-right brushwork on the page, drawing the sounds, then I would come back with red ink, and place the tiny dots and inflections over the image. I did a lot of Sonographs, and I’m going to have to edit them one of these days. Then I discovered in the mid-2000s the idea of putting the Sonographs through a copy machine and jiggling them as the copy-light passed under them, watching the transformation to an altered image by xerographic toner manipulation. I would take a section, blow the image up, and transfer it onto Japanese paper. I also started to cut the images out as stencils. They are still Sonographs, and I still don’t know what to make of them. I’ll come back to them in a few years; see if I see them differently. WMS: I find it interesting to note that your engagement with language is always in a state of flux between the visual and the oral. Letters of the alphabet and phonetic sounds are your linguistic materials, not words, nor any interest in semantics and culturally produced meaning. NK: That’s right. I’ve thought about this quite a lot. I have trouble with language. I don’t know that I think in terms of language. So, if I don’t think in terms of language, then I think in intuitive or spatial terms. My vocal sounds are structural. They exist in space as an utterance, and they have an emotional existence as form. I’m not sure whether I embrace the intuitive because I have difficulties with languagemaybe so. But, a lot of my ideas and concepts come from my involvement with space, and deal with immediate perceptions and emotional responses to the materials I’m using. There are also my experiences with architecture, and the imagination and creation of form in space. Nothing can exist without space. Add motion and intention, and it becomes visible. WMS: Your intellectual curiosity, creative energy, and enthusiasm for life have proven to be a constant source of inspiration for many of your colleagues. But you have mentioned to me on several occasions in the past that the source and inspiration for your creative practice are the Shinto shrines Geku, Naiku, and the Uji bridge in Ise, Japan. Why? NK: When I was in Japan, I went to see the Shinto shrines in Ise, and I was impressed by the simplicity and strength of those buildings. This unique architecture is referred to as heroic simplicity, and the prototype of Japanese architecture. However, it wasn’t until I came back to Canada, and got a book on Ise by the great contemporary architect Kenzo Tange that I was able to really study it as a kind of meditation. WMS: But the shocking thing is that the buildings are destroyed and then rebuilt every twenty years! NK: That has been going on for one thousand years. I’m not sure how long that tradition is going to continue. They are having difficulty training the youth to carry on the tradition. Probably doesn’t matter. The forms of Ise are so beautifully realized that I look at them when my mind is scattered with difficulties and problems. I look at that piece of architecture, and it is so silent, and beautifully resolved. With my own work, I try not to be attached to any of it. It comes and goes, and sometimes I reuse or recycle the material from a previous piece, and apply it to a new experience. My vocal work is constantly changing and shifting. Thank God! WMS: But, I also think that you are attracted to Ise because it exemplifies the transience of all life forms. NK: Yeah. Next year I’ll be eighty, and I’m now aware of how quickly time passes. I guess the rebuilding of Ise every twenty years, and the renewal of the form, is a reminder of the rise and fall of events, the kind of rhythm we see in nature. The fact that it is destroyed and newly rebuilt every twenty years is a rhythm. If it comes to an end in one thousand years, the process of letting it gothat will be another kind of rhythm. W. MARK SUTHERLAND is a Canadian inter-media artist. He and Kubota collaborated on a series of improvised sound poems featured on the CD Cross Rhythm and White Noise (BarKing Boys Music Co., 2001). They have performed sound poetry duets since 1996 at many international festivals, including: Words & Music Festival, DAI Institute, Heidelberg, Germany; The Scream In High Park, Toronto, Ontario; Bobeobi Sound Poetry Festival, Berlin, Germany; E-Werk, Weimar, Germany (in conjunction with the ACC Gallery, and Bauhaus University of Art and Design); Container (Centro Cultura Contemporanea), Florence, Italy; Saipoesia/Yesbepoetry Festival, Teatro San Martino, University Of Bologna, Bologna, Italy; and, Voice ++ Festival, Open Studio, Victoria, British Columbia. NOBUO KUBOTA is a is a multi-media artist whose work includes sculpture, installations, video, music, and sound poetry. He received his Bachelor of Architecture from the University of Toronto (1959), and Doctor of Fine Art, Honoris Causa, from OCAD University (2011). He recently exhibited at the “LIVE” International Performance Art Festival, Vancouver, British Columbia. (2011), the Kelowna Art Gallery, Kelowna, British Columbia (2010), and at the Art Gallery of Peterborough, Peterborough, Ontario (2009). He received the Governor General’s Award in Visual and Media Arts (2009). Kubota currently lives and works in Toronto, Ontario.